Yoga For Smart People | Not for dummies. I am a traditional femme des lettres. I like books and notebooks and have a favorite pen. I have only recently given in to e-books, and sometimes I feel kind of weird about how odorless my kindle is. No ink, no paper, just some electronic chemistry that I don’t understand and a bunch of ones and zeros. I have also been a teacher for years. I don’t just mean yoga. I’ve been an adjunct and a elementary classroom teacher. I believe in education like I believe in few other things. And I like it to be personal. I like handwritten comments and personal feedback. The whole idea of online education has always been kind of crazy to me. I want to know my teachers. I want to know if they have one glass eye or if they never iron their pants. I’m a nerd. I tried to take a distance learning class when I was in college and I was so unengaged that I had to drop it halfway through and beg the teacher for a withdrawal. But I keep meeting people who are crazy into online learning. They take dharma classes online, ayurveda classes, nutrition classes, anatomy classes. And they love it. So, I want to know about it. What is your experience with it?How “smart” can online learning get? Am I just a stalwart traditionalist? What role does this kind of education have in yoga? Some people are doing their whole yoga certifications online. Is this okay? YFSP is seeking submissions about technology & yoga & learning, the decline of interpersonal communication, or whatever you can tangentially relate to this topic in an interesting way. No word count. We don’t care as long as it stays interesting. Star Wars Yoga is real. I know it’s been a while since I reached out, but let me explain. It’s not that I didn’t want to communicate with you, it’s just that I wasn’t sure what to say. I get where it got confusing. Only some level, the stated existence of “smart people” necessarily implies that there are other people who are not smart. And I was a nitpicky and over-curating editor, so I’m sure that didn’t help. I don’t know how to say, “This is a forum for yoga intellectuals who are also really strong writers that are deeply invested in instigating articulate conversations from a (somewhat) research-based point of view, but with a sense of humor. We are looking for a readership of likeminded people who are willing to engage in thoughtful debate and conversation,” in an URL. It’s a limited form. So I chose a tongue-in-cheek name that I thought most people would get. In this I both underestimated and overestimated the yoga community. I underestimated the yoga community’s sense of political engagement. Yay, you! I had no idea that you’d be so pissed off about the seeming exclusivity of the name. Way to fight for equality. Seriously. I also overestimated the yoga community’s sense of humor. I just assumed that my project would be met with an implicit understanding that the name YFSP is mostly a joke, a play on Yoga for Dummies. So, then, what happened next? I feel like Carol Horton is a prime example of what can happen when a smart, but unwitting, fitness enthusiast falls into yoga. She transforms her physical experiences into psycho-spiritual experiences and skillfully navigates Jungian and Reichian territory to translate on-the-mat epiphanies into evidence of yoga’s sympathy with and for contemporary psychology. She even makes karma seem like an accessible idea to non-believers in reincarnation, all while self-consciously acknowledging that she is freely borrowing from different, and perhaps unwilling, traditions. She is a postmodernist par excellence, and I find myself nodding in agreement with her constantly. In addition, I find her combination of vulnerable self-disclosure and academic rigor so unbelievably likable that it actually pains me to criticize her. So I won’t. Allright, y’all. Here we go. I’m an online book club virgin, so let’s take it a little slow. Yoga is a spiritual, although not specifically religious, pursuit. Its lineage is based on leader-follower relationships. As Jen so concisely puts it, yoga is not categorically different than these other spiritual traditions, and it is equally susceptible to the corruptions of power, authority and popularity. What is different about yoga, though, is that its philosophies encourage independent self-inquiry. This speech gives specific examples of the types of coercive tactics and abuses of power one might find in a society governed by a cult-of-personality. With this information in our thinking caps, the class can then discuss other historic cults-of-personality, like Mao, Khomeini, and Mubarak and the propaganda needed to maintain these brutal, repressive, and oppressive regimes. 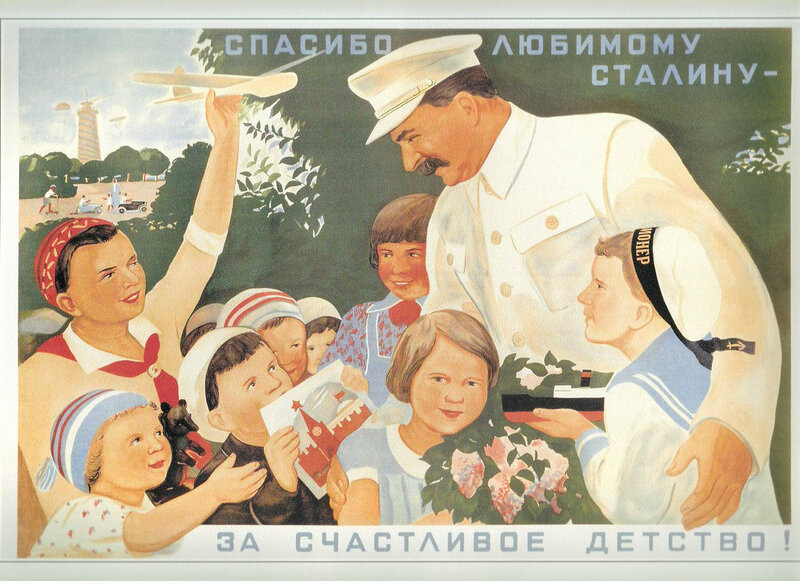 Propaganda for Stalin’s regime often showed this type of affection from women and children. Meanwhile, he was responsible for the deaths of tens of millions of human beings, women and children included. It’s ok though, because Stalin loves women and children, and this was all for their benefit, anyway. Clearly.